December 27, 2016 – DOLPHINS ARE IN THE PLAYOFFS!!! In this episode, we review our amazing win over the Bills, and our entrance into the playoffs! In addition, we look ahead to our final regular season game against the New England Patriots. 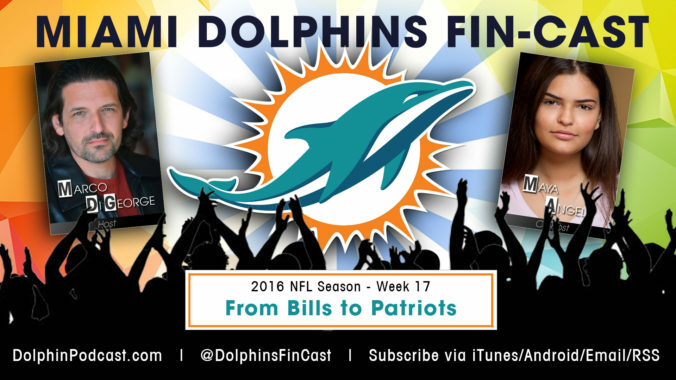 Also, we give you our FinsUp and FinsDown for the week, review the latest Dolphins news, take a look Around the NFL, review the NFL Scores and Standings (as well as Playoff implications), and give you our Picks of the Week, where we run through our thoughts for every game in Week 17. Go FINS!